Blue and gold adorn these earrings created by Valentin Magro. 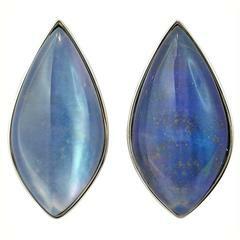 The bodies are lapis lazuli carved into cushion shaped cabochons. 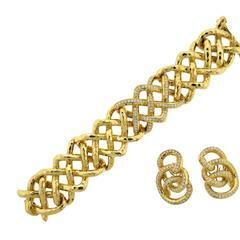 These are mounted two to an earring, with an 18k yellow gold crisscross in between. This gives the impression of a single elongated gem. Gold triangles brighten the tops and bottoms of each earring. Golden flecks appear in the jewels themselves, giving the lapis a starry look. The four gemstones total 54.16 carats. These earrings are finished with clip backs. Measurement detail - width 0.64 inches (16 mm), length 1.37 inches (35 mm), depth 0.33 inches (8 mm). These simple yet elegant Valentin Magro earrings feature lapis lazuli cushion cabochons mounted in 18 yellow gold and finished with clip backs. These Valentin Magro earrings feature Black Jade Earrings with gold cushion in the center and flat trilliant claws on four edges in 18kt yellow gold. 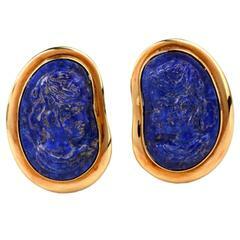 These earrings are made in 18kt yellow gold, they feature lapis and jasper inlay and are finished with clip-backs. 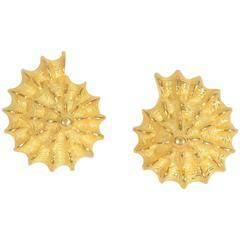 Beautifully sculptured and textured shell earrings by Valentin Magro. They are 18 karat gold; post and clip backs. They are still in production and are sold by Magro for $5035.